PASTA RICE & GRAINS | What's for Dinner? Posted on March 20, 2017 by What's For Dinner? Lately, I’ve been determined to make more room in my pantry, so I’m making a concerted effort to use ingredients I already have to plan my meals. It’s kind of like an overcrowded closet…until you start cleaning it out, you really don’t even know what all you’ve got! Such is the case with my pantry, so when I ran across some organic red quinoa, I decided it was time to make a meal! 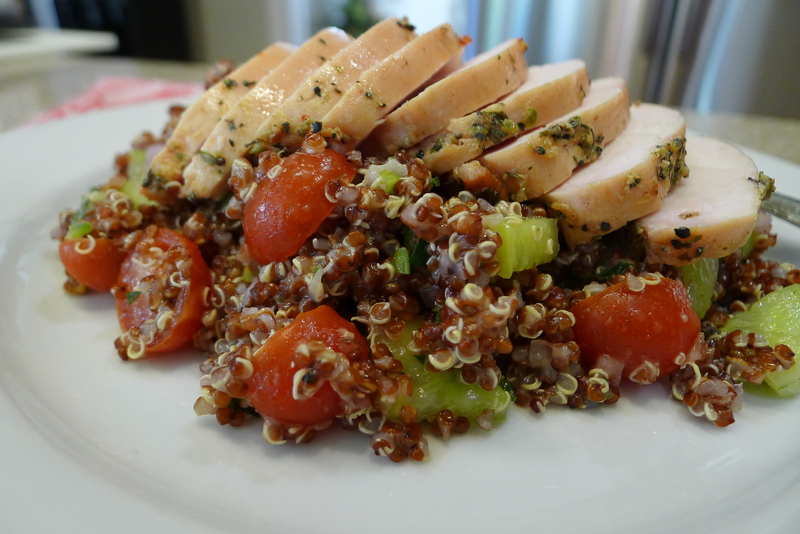 Hubby had the Traeger Smoker fired up and ready to smoke some chicken breasts, so I thought a nice healthy quinoa salad topped with a bit of protein sounded like perfect way to top of a beautiful day of sunshine! Rinse quinoa thoroughly before cooking. Combine broth and quinoa and pinch of salt in medium saucepan. Cover and simmer 15-20 minutes or until liquid is absorbed and quinoa is tender. Combine cucumber, tomatoes, mint, shallot, serrano, lime zest and lime juice. Toss together, and drizzle with olive oil. Add cooked quinoa, fold to combine and add salt & pepper to taste. Add more lime juice if desired. If you like this recipe, feel free to Tweet it, Facebook it, or just email it by clicking the “share” button below. Still Haven’t Made Valentine’s Reservations? Posted on February 13, 2016 by What's For Dinner? By now, if you haven’t made dinner reservations for Valentines, it’s a pretty safe bet that you won’t be dining out! Don’t sweat it, though, as I have a few last minute ideas for cooking at home! Let’s face it, restaurants are going to be packed, and even if you could get reservations, who wants to fight the crowds? 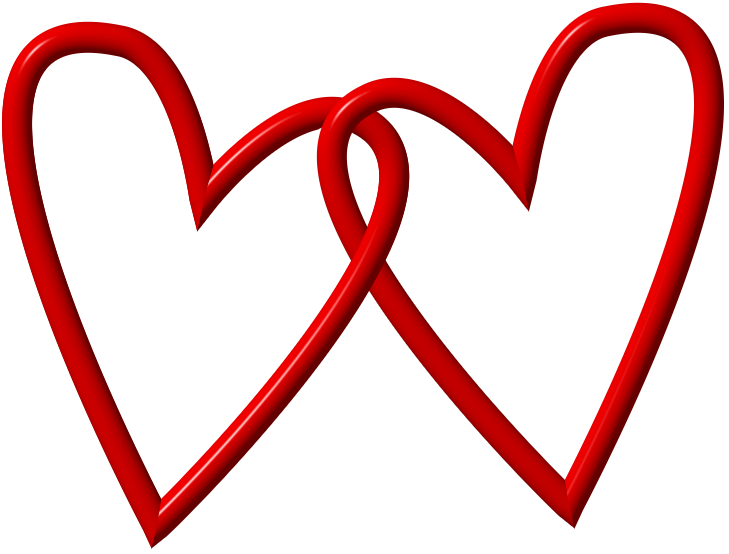 Stay home, light some candles and enjoy a nice dinner with your sweetie! For dessert, this might just satisfy your chocolate craving! Posted on May 3, 2013 by What's For Dinner? Farmers’ markets are one of the oldest forms of direct marketing by small farmers. These markets have become extremely popular throughout the country and are a great way for consumers to shop for fresh, local and seasonal produce. My favorite market here in our area is the Pearl Farmers Market. It’s so much fun to get up early Saturday morning, head down to the Pearl, grab a chocolate croissant from one of the bakery vendors and peruse all the beautiful produce. There’s live music, cooking demonstrations, and everyone just has a great time. This dish is a great way to showcase the bounty you bring home! It’s not only beautiful, but makes a delicious light dinner with a loaf of good crusty bread and a nice crisp white wine! Bring a 6-8 qt pot of well-salted water to a boil for corn and pasta. While water is coming to a boil, mince and mash garlic to a paste with 1/2 tsp salt, then stir together with vinegar, oil and 1 tsp salt in large bowl. Add tomatoes and stir gently, then set aside. Cook corn in boiling water until tender, 4 to 6 minutes, then remove with tongs and cool. While corn cools, peel lengthwise ribbons from 1 side of a zucchini with vegetable peeler or mandolin into another bowl, stopping when you come to seedy core. Turn zucchini a quarter-turn, then peel more ribbons, stopping at core. Repeat on remaining 2 sides of zucchini (you will end up with a rectangular shaped core). Cut corn from cobs; add corn to tomatoes. Cook pappardelle according to package directions until al dente. Just before pasta is done, stir in zucchini ribbons and snap peas, and cook 15 seconds. Drain pasta and vegetables together in a large colander and add to tomato mixture with onion (if using) then toss gently. Add herbs and toss gently again. Use either a mandoline or a vegetable peeler to make your zucchini ribbons. A vegetable peeler is perfect for making big shavings of Parmigiano-Reggiano. Posted on May 1, 2011 by What's For Dinner? In a study, it was found that teenage boys will routinely scarf down 2,000 calories at lunch if given the opportunity, without any fat-producing effects. Given the chance, 14- to 17-year old guys eat more than girls their age and turn those calories into height and muscle mass. Click here to see full article. No surprise to me!! My 8th grade 14 year old son, TBP (Teenage Bottomless Pit), eats me out of house and home. At 6’4″ and 190lbs, obviously the study is right on! Yesterday, we attended TBP’s end-of-season lacrosse party, and I was blown away by the food that was served. I’ll save the smoked brisket recipe for another post all it’s own, but suffice it to say, it was the absolute BEST smoked brisket I’ve EVER had…BAR NONE!! There was another dish that caught my attention, and that’s the one I’ll share with you today. 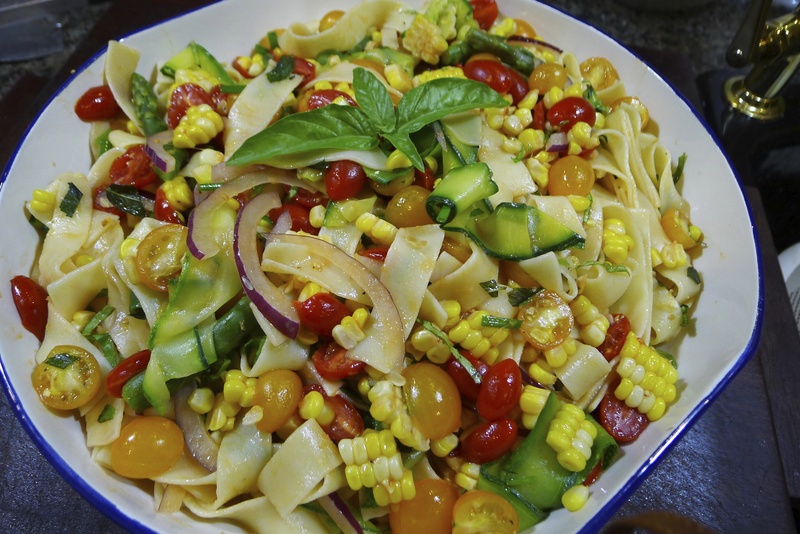 It’s a pasta salad that was delicious and full of flavor. I love anything Italian, and this Antipasto Pasta Salad is a keeper! It can be prepared ahead of time and is great for outdoor gatherings. If there’s something in there you don’t like, omit it and add something else. It’s a very versatile salad…Thanks, Ana, for sharing the recipe! In a kettle of boiling salted water cook the pasta until it is tender and drain. In a blender, blend the garlic, mustard, vinegars, water, oil, and salt to taste until the dressing is emulsified. In a very large bowl, toss the pasta well with the dressing and stir in the sun dried tomatoes, mozzarella, garbanzo beans, salami, peperoncini peppers, red pepper flakes and parsley. Chill the salad, covered for one hour. The salad may be made 2 days in advanced and kept covered and chilled. “Julienne” is a term meaning to cut into thin strips, (matchsticks) usually 2″ x 1/8″ x 1/8″ . “Batonnet” refers to matchstick type strips a little bigger, (think french fries) usually 2″ x 1/4″ x 1/4″. To see a video of how to do this, click here. Posted on March 9, 2011 by What's For Dinner? Risotto…It’s a great dish to make at home, but many people don’t, because they think it’s too difficult. It’s really very easy…all it takes is some understanding of the whole process and a little patience. If you give it time and let it do it’s whole “creamy” thing, you’ll have yourself a delectable dish! Risotto is an Italian rice dish made with a specific type of rice. “Arborio” is a short grain rice high in amylopectin, a starch that dissolves in the cooking process giving the risotto its creaminess. Usually, in savory risottos, onion is sautéed for flavor, the rice is added and allowed to toast, then it’s all cooked in hot liquid that’s slowly added until fully absorbed, creating a luxurious, creamy risotto. Coating the rice with the oil prevents it from absorbing the liquid too quickly, thereby creating a more tender risotto. The secret is to simmer the rice gently while stirring and then “gradually” add the hot stock making sure the liquid is fully absorbed before adding more. This shouldn’t take more than about 20 minutes. Don’t make the mistake of using a long-grain rice, as it won’t produce the right flavor or texture. Mantecare, which means “to whip or whisk” in Italian, is the last step to finish the risotto. Off the heat, a bit of butter and freshly grated Parmesan cheese are quickly stirred in. This helps bind the ingredients together while adding flavor and silkiness to the risotto. Once you’ve gotten down the art of making risotto, the possibilities are endless! You can incorporate just about anything you can imagine, from different vegetables, meats or a combination thereof. And don’t forget dessert risottos…they are fabulous! 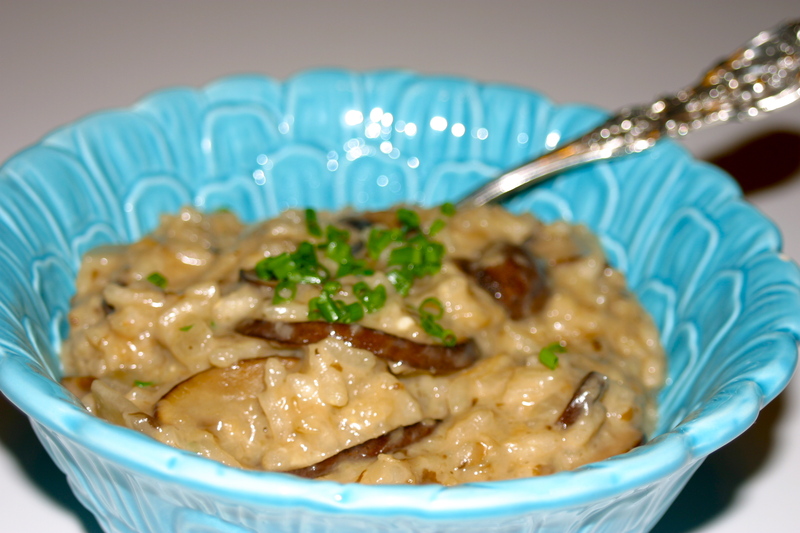 For this mushroom risotto, I combined ideas from several recipes and came up with what I think is a winner! This dish not only gets it’s deep flavor from the fresh mushrooms, but also gets an added punch from some dried mushrooms that are reconstituted in hot water, then pureed into a paste and added at the end. So, if you can’t take a trip to Italy right now, whip up one of their signature dishes, pull out a great bottle of Chianti, and savor the flavor! salute, ricchezza e felicità e il tempo necessario per godere di loro! Cover the bottom of a large skillet (12-inch) with approximately 3 tablespoons of olive oil. Add smashed garlic cloves and heat over medium heat until garlic is fragrant and oil is hot, but not smoking. Remove garlic and discard. Add mushrooms, and lightly season with kosher salt. Saute over medium heat until mushrooms are just tender and lightly browned. Set aside. Using your hand, carefully scoop the reconstituted dried mushrooms out of the hot water and puree in a food processor with just enough of the mushroom water to make a smooth mushroom paste. Carefully scoop out about 1 cup of the top portion of the mushroom water for use in the risotto. Discard the rest, as it will contain sand and dirt from the mushrooms. Set the mushroom paste aside. To a risotto pan or medium saucepan, add 2 tablespoons olive oil and heat over medium-high heat. Add onions, lightly season with salt, and cook until translucent, stirring frequently, about five minutes. Add rice and stir to coat with olive oil. Continue to stir and cook for about 2 to 3 minutes until rice starts to toast. Add white wine, stirring and cooking over medium to medium-high heat until wine is absorbed. *Note: You may need to adjust your heat during this process of adding liquids, depending on the type of pot and your heat source. You do not want the rice sticking as you cook it and the liquids absorb. Add the reserved one cup of the mushroom water, stirring frequently, until absorbed. Repeat this process with the hot chicken stock two more times. You will have one cup of stock left. This will take some time, so be patient. Add the last cup of stock and stir. Add reserved mushroom paste along with the fresh mushrooms and cook until rice is cooked, yet firm to the bite (al dente) and the mixture is creamy. Remove from the heat and add the butter and cheese. Whip until well combined. This will set the perfect consistency of the rice which should flow and not be able to hold it’s shape. Check for seasonings and garnish with chopped chives or parsley. **Liz’s Note: Be sure and taste at each stage and add salt as needed. Posted on August 10, 2010 by What's For Dinner? I have 8 more days of being able to sleep past 6:15 am! Eight more days until school starts back up. Ugh! Not that I’m counting, or anything, but I REALLY DO ENJOY SUMMER!…not having to get up at the crack of dawn, not having to constantly be asking, “Have you started your homework?…Have you FINISHED your homework?…Do you even know what homework YOU HAVE?” LOL! Summer is so laid-back for us…hanging out at the pool, having friends over to grill, the list goes on and on. I really don’t have time now for another trip before school starts, so in an effort to pretend I was in the Caribbean tonight, I made a recipe from a new cookbook I purchased, called Cooking Light-Cooking through the Seasons. In keeping with my summer theme of “Main Meal Salads”, I tried one of their summer recipes called “Mango Rice Salad with Grilled Shrimp”. 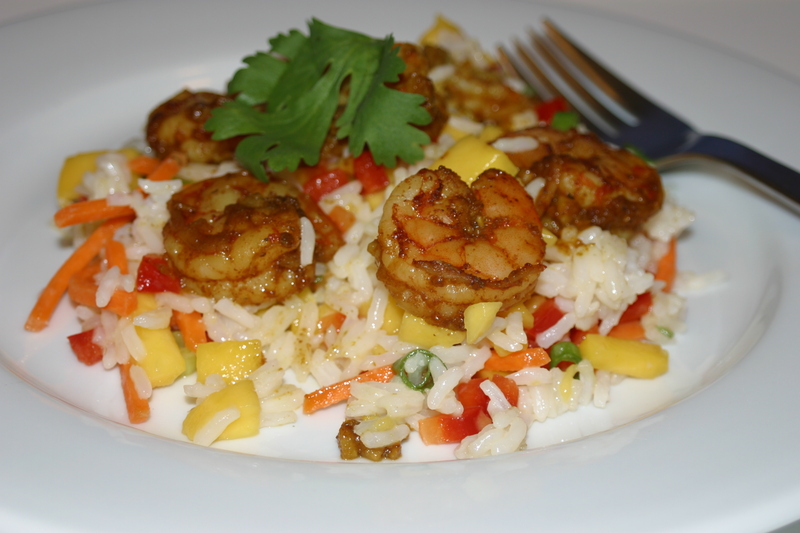 It was a nice blend of sweet (a little coconut milk in the rice added some sweetness along with the diced mango) and spicy (the shrimp are marinated for about an hour in a few different spices, one being red pepper which I kicked up a few notches!) Instead of heading out to the grill, I decided to roast my shrimp on a sheet pan instead, and they turned out great! If you don’t have the time to make it down to the islands this summer, try the next best thing, and cook up a little island food! Bring water and coconut milk to a boil in a medium saucepan; add rice. Cover, reduce heat, and simmer 15 minutes or until the liquid is absorbed. Add carrot and next 7 ingredients; toss gently to combine. Prepare grill or grill pan to medium high heat. (Or pre-heat oven to 400° and roast shrimp for 8-10 minutes). Thread shrimp onto each of 12 (6 inch) skewers. Place skewers on grill rack or grill pan coated with cooking spray; grill 3 minutes on each side or until shrimp are done. Serve kebabs over salad. Garnish with cilantro sprigs, if desired. Note: I roasted my shrimp in a 400° oven for 10 minutes. They were perfect! Posted on July 23, 2010 by What's For Dinner? Recently, Hubby and I snuck away to sunny California to celebrate 30 years of marital bliss (and yes, in case you’re wondering, I DID get married at 12! LOL). We wanted to visit some of the wonderful wineries around Santa Barbara and drive the beautiful coastline! Let me just say that if I can figure out a way to move to Santa Barbara, I’m there! The scenery is stunning, the weather is as close to perfect as I’ve been in, the food and wine were magnificent, and on top of all that, there was even great shopping! It just doesn’t get much better than that! 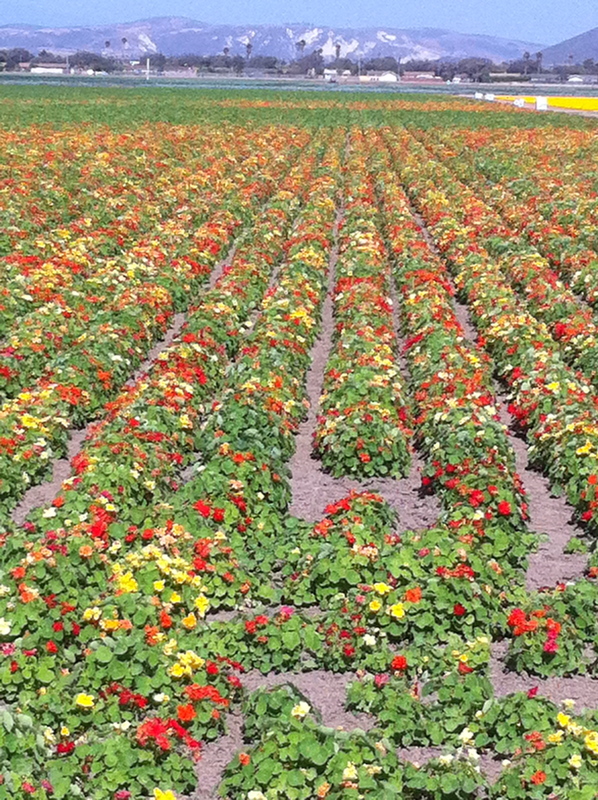 After an afternoon of winery touring, we decided to drive out to some of the flower seed farms around Lompoc, where they actually grow the flowers to collect seeds for companies like Burpee and Park Seeds. 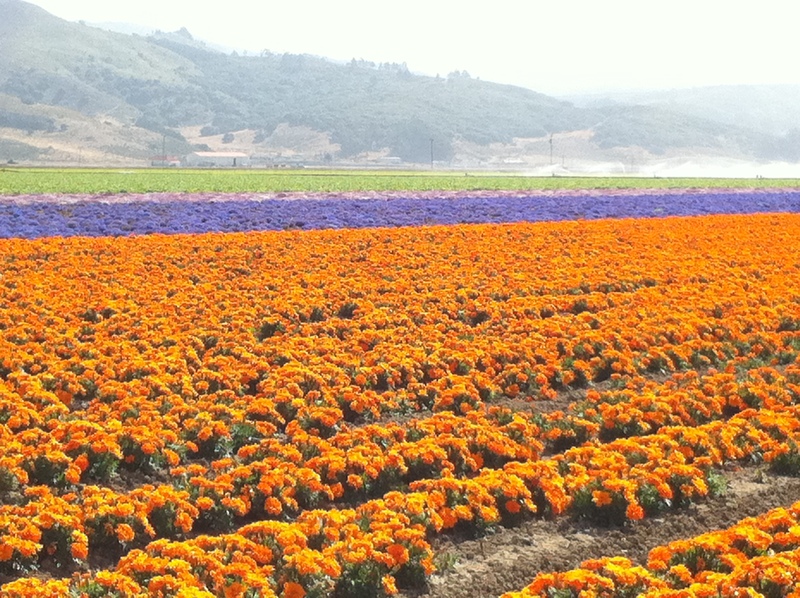 I couldn’t believe how gorgeous the fields of flowers were. The sky was bright blue, the temperature was in the mid 70s, and we didn’t have a care in the world. It was truly a perfect day! Bring a 6-8 quart pot of salted water to a boil. Meanwhile, heat 2 tablespoons oil in a 12-inch skillet over moderately high heat until hot but not smoking, then sauté shrimp, turning over once, until just cooked through, about 2 minutes, and transfer with a slotted spoon to a large bowl. Add garlic and the remaining 2 tablespoons oil in skillet along with red pepper flakes, wine, salt and pepper and cook over high heat, stirring occasionally, 1minute. Add butter to skillet, stirring until melted, and stir in shrimp. Remove skillet from heat. Cook pasta in boiling water according to box directions until just tender. Reserve 1 cup pasta-cooking water, then drain pasta in a colander. Toss pasta well with shrimp mixture in large bowl, adding some of the reserved cooking water if necessary to keep moist. Top with parsley and tomatoes and freshly shaved Parmesano-Reggiano.